Giving tomato breeders and ketchup fans something to cheer about, a Cold Spring Harbor Laboratory (CSHL) scientist and his colleagues at the Hebrew University in Israel have identified a gene that pushes hybrid tomato plants to spectacularly increase yield. The yield-boosting power of this gene, which controls when plants make flowers, works in different varieties of tomato, and crucially, across a range of environmental conditions. "This discovery has potential to have a significant impact on both the billion-dollar tomato industry, as well as agricultural practices designed to get the most yield from other flowering crops," says CSHL's Zach Lippman, Ph.D., one of the three authors on the study, which appears in the journal Nature Genetics online on March 28th. The study is co-authored by Israeli scientists Uri Krieger and Professor Dani Zamir. The team made the discovery while hunting for genes that boost hybrid vigor, a revolutionary breeding principle that spurred the production of blockbuster hybrid crops like corn and rice a century ago. Hybrid vigor, also known as heterosis, is the miraculous phenomenon by which intercrossing two varieties of plants produces more vigorous hybrid offspring with higher yields. First observed by Charles Darwin in 1876, heterosis was rediscovered by CSHL corn geneticist George Shull 30 years later, but how heterosis works has remained a mystery. Shull's studies suggested that harmful, vigor-killing gene mutations that accumulate naturally in every generation are exposed by inbreeding, but hidden by crossbreeding. "But there is still no consensus as to what causes heterosis," says Lippman. "Another theory for heterosis, supported by our discovery, postulates that improved vigor stems from only a single gene - an effect called "superdominance" or "overdominance." To find overdominant genes, the team developed a novel approach by turning to a vast tomato "mutant library" - a collection of 5,000 plants, each of which has a single mutation in a single gene that causes defects in various aspects of tomato growth, such as fruit size, leaf shape, etc. Selecting a diverse set of mutant plants, most of which produced low yield, the team crossed each mutant with its normal counterpart and searched for hybrids with improved yield. Among several cases, the most dramatic example increased yield by 60%. This hybrid, the team found, produced greater yields because there was one normal copy and one mutated copy of a single gene that produces a protein called florigen. This protein, touted as the breakthrough discovery of the year in 2005 in Science magazine, instructs plants when to stop making leaves and start making flowers, which in turn produce fruit. In plants such as tomatoes, flowering (and therefore yield) is controlled by a delicate balance between the florigen protein, which promotes flowering, and another related protein, that delays flowering. A mutation in only one copy of the florigen gene causes the hybrid to produce more flowers in less time - the key to improved yield. "It's the Goldilocks concept," explains Lippman. "What we find is that to maximize yield, you can't have too much or too little florigen. A mutation in one copy of the gene results in the exact dose of florigen required to cause heterosis." The scientists have observed the gene's heterosis effect in different varieties of tomatoes and in plants grown in different climate and soil conditions, both in Israel and locally in New York at CSHL and the Cornell Horticultural Experiment Station at Riverhead, NY. In addition to superior yield, the hybrids also display another, perhaps equally important quality - taste. Tomato plants only produce a finite amount of sugar, which they distribute equally among their fruits. So higher yields usually result in each fruit having less sugar. But, remarkably, the florigen gene also boosted the sugar and sweetness of individual fruits. The researchers are already planning to explore if genes related to florigen in other crops can cause heterosis and improve yield. The concept that a mutation in only one copy of a single gene can improve yield has broad implications for plant breeding. "Mutant plants are usually thrown away because of the notion that mutations would have negative effects on growth," says Lippman. 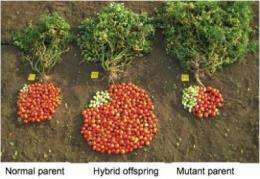 "Our results indicate that breeding with hybrid mutations could prove to be a powerful new way to increase yields, not only in tomato, but all crops." A big bunch of tomatoes? More information: "The flowering gene SINGLE FLOWER TRUSS drives heterosis for yield in tomato" is scheduled to appear in Nature Genetics online on March 28th.